Gary Jibilian's duo with drummer Jay Setar packs a one-two progressive punch: tight, intricate, intense performance of original compositions and polyrhythmic loop-based jams. 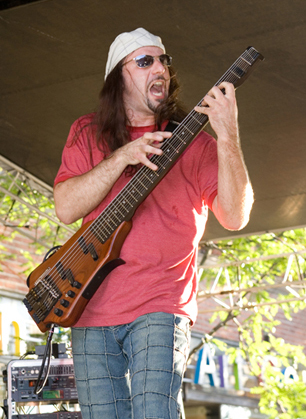 In the 1990s, Gary Jibilian had been working in the Detroit-area music scene for several years, first as a member of the progressive metal band Present Absence, then getting into the local blues scene, and ultimately ending up as the bassist for internationally renowned Detroit blues artist Thornetta Davis. 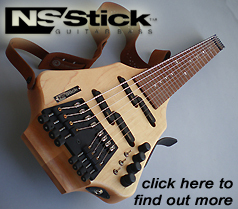 All that changed in August of 2000, when Gary first connected with the NS/Stick, a multi-mode "guitar-bass" co-designed by Emmett Chapman and Ned Steinberger. One of the rarest instruments around, even rarer than The Stick, the NS/Stick is a true hybrid tapping instrument that can also be played with conventional techniques like strumming, picking and plucking. The string damper is easily pulled back, letting the open string ring normally as on a bass or guitar. Gary Jibilian became one of the first players to take it up, and has subsequently become one of its defining voices. 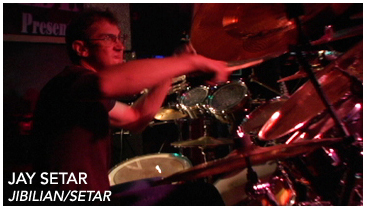 Gary has performed on the NS/Stick primarily in a duo format with drummers. He plays the whole instrument, from deep intricate bass lines to wailing distorted guitar solos, sometimes covering rhythm and melody all at once, sometimes building up a piece out of individual loops, even adding MIDI controlled synth tones to the mix. His stage presence is dramatic and emotive, and matches the wide variety of sound issuing forth from his amps. Just add drums and you've got a progressive rock band. Greg: Did you tap on the bass before getting an NS? Yes. I was tapping on the bass for about 12 years before I received my NS/Stick in 2000. My early influences were Billy Sheehan, and Stu Hamm, but what really inspired me to explore two-handed tapping was the first time I saw David Harbour play live with David T. Chastain. He blew me away with all of his bass playing techniques, especially when he would tap during his solos. I saw him 5 times in the early '90's with Chastain, and corresponded a bit via email and phone calls since then. His aggressive, "digging-in" style is similar to mine, where you feel like you're physically connected to the instrument. Greg: I've really enjoyed watching and listening to your performances with Jay on the new Stick Night DVD. There's so much energy and expressiveness in your playing, and your body language. What goes through your mind while you're performing? Gary: Mostly, it's just being in the moment. Every performance is unique, and has its own personality, which translates into how we sound and act like onstage. I'm very aware of the process that makes people go through the many steps it takes to get out of their comfort zone to go see a live band on any given night. They first make the decision that they want to see you play... then, if they have little children, they have to arrange for a babysitter. This costs money, unless they have friends or family that will provide this service, pro bono. Depending on when our set starts, they then have to deal with driving in traffic (we're in L.A., so they might have to top-off the tank). The venue may not have free parking, so they have to dish out $5 to $10 to rent a spot to prevent getting towed (read all signs carefully!). Then, they have to pay for admission just to get into the place. "Sorry mom, we don't have room on the guest-list tonight." Their mouths are dry as sandpaper, and their nerves are totally shot from the drive, so they order a series of drinks at $7.00 each. When we hit the stage, I say to myself, "These people came here to escape something, and so did I," so I try to connect with them on that level, where we can forget all the negative aspects of our lives, and just focus on the emotion evoking music we're creating, together. It's a very natural thing, though, and nothing is contrived. If I let loose on stage, it's because that's the way I feel at that moment. The energy of the audience, or lack of, is what dictates my actions on stage. Greg: You and Jay really take advantage of the tightness that a duo can develop. How do you keep it together when there's a loop involved? Gary:We try out best to listen to each other at all times, especially during parts where we're playing over a loop. If I lay down a loop, and it's not perfect, but close, we'll jam to that, knowing where we have to make the correction in timing. If we get 180 degrees off the loop, Jay will adjust his playing to compensate. We've had some pretty interesting outcomes as a result of "looping weirdness." There's nothing better than nailing all the loops during a live set, but that's a rare occasion. Greg: Watching your "Live at the Unknown Theater" DVD is a really interesting experience. How did you hook up with visual artist Norton Wisdom, and are you interacting with him in some way or does he key off what you're doing, or both? to this live concert DVD.